Egil Ellis wins the 2004 Open North American! Racers will go out at 2-minute intervals, starting at 1 p.m. AST on Second Avenue in downtown Fairbanks. Note that Sunday will feature a reverse start order. 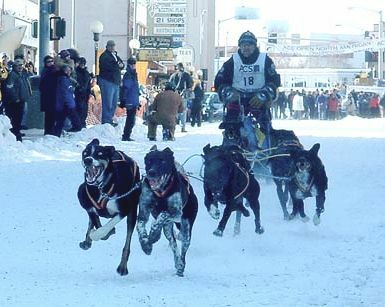 The 2004 ONAC is again sponsored by ACS--please let them know you appreciate their generous and continued support of the oldest continuously run sled dog race in the world. You can find more information about the race and its history at http://www.sleddog.org/races/onac/index.html including a complete history of the winners. A legend returns - George Attla starting in 6th position.